While some consider gift giving to dogs both an indulgence and cra-cra, the practice is part of the rich tapestry of American history. Although possessed of only meager goods, early settlers often gifted their loyal canines with birch bark canoes and cholera. Available nowadays are effective medications for cholera as well as subway tokens, but pet owners seem to favor gifts that are more personal. Below is a guide to the most popular gifts dogs are raving about this year. Once thought the exclusive domain of humans and teenagers, virtual reality has proved a hit among dogs bored with the selection of trees in their neighborhood. 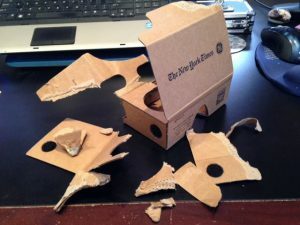 Promotional VR glasses distributed by the New York Times. Note to NYT: Never deliver Virtual Reality Glasses to a home that has an Actual Reality Terrier. There are benefits and drawbacks to dogs wearing virtual reality glasses. On the plus side, VR opens a kaleidoscopic world of colors, hues and tints to your dog, which, of course, he only sees in black and white. Sensible and practical pet apparel comes in two popular varieties: coats that can be peed on, and booties that can be chewed. Let’s examine both from a distance. Winter can be tough on dogs, depending on the nature of their fur and their willingness to pay a reasonable share of the heating bills. A good jacket is best determined by the quality of its insulation and the number of dancing cartoon puppies across the fabric. Boots – or “booties”, as they are known by the mountain Sherpa of Nepal – provide a canine invaluable protection from snow, ice, and road salt. Ideally, dog booties should feature non-slip soles, and be fabricated of a weather-resistant synthetic material or a natural animal hide, although preferably not dog. Even if it’s another dog, not yours. Putting booties on a dog – especially a terrier – is much like putting booties on a raging, uncontrolled forest fire, but a lot more risky. Oxford and Penguin, BFFs for about 20 minutes. 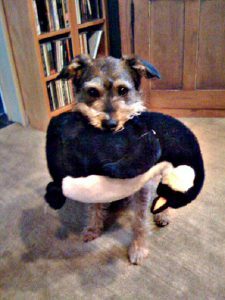 As the owner of a terrier, I am not equipped to offer guidance in the selection of a playful dog toy with the look and feel of a small vermin that squeaks in realistic terror when chewed. Watching Budleigh or his predecessor, Oxford, our formerly alive terrier, “play” with a stuffed animal is gruesome. Like a National Geographic Channel program, “Vanishing Wildlife of the Serengeti” where we observe who is vanishing. Or at least where their heads are going. Brisby the Buddhist believes all life, even that which is stuffed, is sacred. Unlike his terriers, he does not hunt for pleasure or sustenance, for he is One with the Can Opener. Through a succession of stuffed animals, he has tried to impart wisdom to his terriers, with mixed results. Brisby is not exactly a success story of higher education. « Ask a Terrier: Can’t We All Just Get Along? Am I cruel for not getting Jake booties? He does that “oy, vey iz mir” walk after going through white salted sidewalks and roads. And, why can’t everyone just use pet safe salt? Love your blog-everything about it. It made me laugh and laugh.